As time has passed, more and more people are going to college in the United States. Unfortunately, this is not a good thing. Let’s see why. Keep in mind that, since the seventies, the size of the population has grown by around 100 million, so this larger percentage is even bigger than you might imagine–25% of 18-24 year olds in 1970 is a much larger number of people now. Point being, there are a lot more people in college than there were during the 45-73 period. So we should be disturbed right off the bat by this–sending more people to college has not translated into improved economic performance. In contrast, our rate of growth has declined as the rate of enrollment has risen. How can this be? In a word, structure. 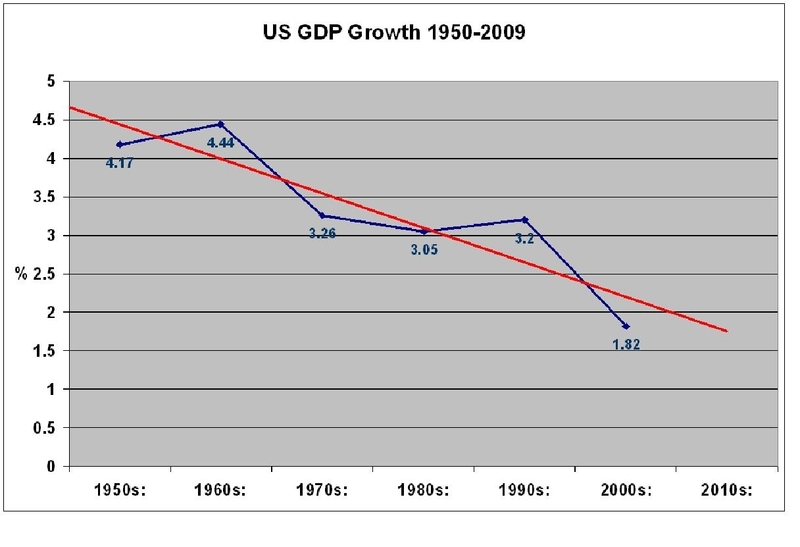 The economy is not structured to supply every person with a high-income position. Imagine if you will that every person was a very hard working genius without exception such that all applications to universities were perfect and identical. It would still remain the case that the best universities would have a fixed number of available places. What you would get is a lottery for spots, with decisions made arbitrarily based on qualities of otherwise little significance. Perhaps examples of “taking initiative” or “extra-curricular activities” or “leadership experience”. Oh–you say universities already base their decisions on those things? Well, now you’re beginning to see the problem. A lot of people do not get into the best universities not because there’s any evidence that they are not capable of working at the level in question but purely because there are not enough spots. Inevitably, only a given number of students can go to the best universities, no matter how good the pool of applicants is. This applies even more strongly in the job market. Even if every single person were an Ivy League graduate, the number of available high-paying positions provided by the economy would not expand. The economy would still demand that some people fill minimum wage positions. Poor-paying positions are not created out of the kindness of our hearts to provide employment to those without education, they exist because we need those jobs to be done, and if they are not done, our economy will not function. If every minimum wage employee in the country went on strike tomorrow, the nation would be brought to a standstill. Unfortunately, this means that a given portion of the population, regardless of the level of education it attains, how smart it is, or how hard it works, is going to end up in low-paying work. A lot of people are forced by the urgent need to repay student loan debt to take whatever jobs they can find, denying them time to find the right jobs for them or the opportunity to negotiate higher salaries. A lot of people will have to delay buying homes in the future. A lot of people will get married or have children while they are still encumbered with student loan debt, locking them into lives they never really chose themselves. Take these together and we find that for many students, college is not freeing them to pursue their dreams, but robbing them of their freedom to determine their own destinies. The student loan debt is the beginning of a functional enslavement, a dire dependency on an employer for money straight out of college that has the potential to last a lifetime if a house or a family is added on as well. So what we have here is a perverse incentive to go to college. If you don’t go to college, you are guaranteed to be one of the people who has to work for a poor wage. However, because so many people now go to college for precisely this reason, going to college is no guarantee of success, and you could end up just like those who don’t go to college but with substantially more debt. And in the meantime, with costs rising every year, the amount of debt you have to displace grows. We’re currently reading Nickel and Dimed by Barbara Ehrenreich with my Track 2 sophomores. The book purports to be a bold social experiment in which the highly educated author eschews the advantages of her education to see what it’s like to struggle along in the grind of the low-wage worker. It’s not a bad idea for investigative journalism. Unfortunately, Ehrenreich is a whiny, entitled elitist and instead has written a book that is designed to be easy for the well-off to read and wring their hands about the impossible plight of the working poor. I mention this because, if you look past her sniveling contempt, there are some real portraits that show the financial situation of a low-wage worker is already so close to the margin that adding even a modest additional expense (say the minimum payment on a $10,000 loan taken out for the year the worker tried college, but flunked out or quit). If you have a day or two over your break, it’s worth a read, if you haven’t already. Thanks for the recommendation, Mr. Mathew, I’ll check it out. It makes sense that what might seem like a very marginal additional cost to a well-off person could be the difference between default and solvency for someone further down the wage scale. Minimum monthly payment on a $10,000 loan at 7.5% over 20 years is a little over $80. A full day’s wages (after taxes), even if your guy gets his new minimum wage through. Cost of the loan even if it does get paid off is just under $20,000. Huge drain on the economy because almost none of the payment gets cycled back into service. It’s almost 11 years before even half of the payment goes to principal (129th payment). And instead of investing money where it could best generate growth and jobs, and the money is getting invested on surplus university graduates, so the inefficiency is compounded. I think I missed the tuition hike by about two years; I only have $20k in unpaid student loans (at an extremely low interest rate). My alma mater now charges more than twice what I paid then. In comparison, I paid off roughly $28k car loan (interest included; own it now), in roughly 5-6 years. So I figure, I could do the same with my student loan, provided I don’t shove myself into ridiculous debt (like a mortgage for a house I don’t even want). If it will take you 5-6 years, I imagine those who attended your alma mater a couple years later will need 10-12. For a student who graduates at 22, that wipes out the period during which most people marry…nasty stuff. I read from a student of another nation (I want to say the UK, but I’m uncertain) who explained their nation’s debt-payment system for student loans, and it seems much, much more effective: the debt must only be paid if the one in debt has an income of over a certain amount, and only a certain percentage must be paid. There’s also the ideas of field caps and full-time schooling that needs a closer look. Some nations (again, I believe the UK does a bit to this extent, though perhaps not very strongly; I apologize for my lack of knowledge on the specifics here) place caps on how many students may be enrolled in any given field based on job demand. If there’s say, a very high growth in engineering but a very low or negative growth in, say, Physics, then more engineering students will be turned out and Physics will become a harder field to enter. Being a full-time student seems to stem from the primary and secondary education systems, as well as many of the earliest university students: rich kids whose parents wanted them out of the way for a while. They had zero need to worry about this “money” thing, and thus spending four years not working while also “being financially responsible” was hardly an issue. Now we see people entering whose parents cannot support them, yet they (…we) still enter college full-time, often at the prodding of the universities themselves, as part-time students fair quite a bit more per credit. The issue, though, is that the social interest may be better served if most students were part time. Part time students would be able to take full time jobs. Being generally uneducated and inexperienced, this provides an excellent base for minimum wage jobs. However, since the education is still being done, just at a slower pace, this means the pool of educated people is diminished by age. Assuming the life expectancy doesn’t expand as a function of this, at least at a faster rate, then by moving the average age of completing education to, say, 28, that means 18-28 year olds are now open for hire and the unneeded pool of workers is lower as 28-65 year olds make up a smaller number than 22-65 year olds. I am certain you are right that the UK does not require that loans be paid back if graduates end up making an insufficiently large income–that was part of the recent tuition fees reforms (though the reforms remain unpopular, as they increased the total size of the fees). The difficulty with implementing that policy in the states is that many of the individuals and organisations involved in student lending would be loathe to be put in a position where they may not see a return on their loans even in cases in which the individuals in question may be financially capable of repayment. 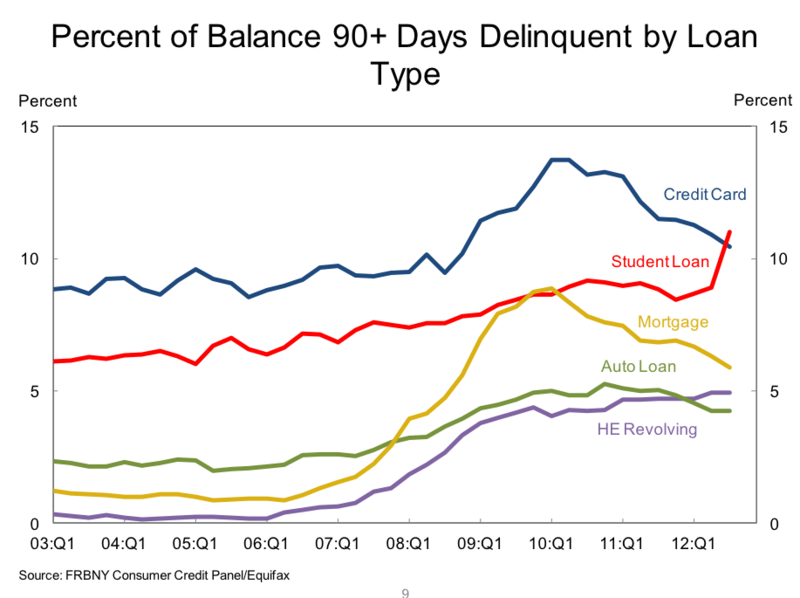 Already the delinquency rate for student loans is rising, and this would effectively raise that rate significantly, assuming a reasonably high minimum salary for repayment. You also get the problem of people on the borderline between having to repay and not having to repay having an interest in keeping their incomes depressed in order to avoid loan repayment. Field caps are easy to implement when the university system is state-run, but in the American context there remains a robust private university system that presumably would remain immune to such regulations, in which case the public universities would only be further undermined. Part time students seems to me to be a treatment rather than a cure, and one with dangerous side effects. The key one for me is that it has the negative externality of significantly reducing the career lifespans of individuals who require graduate education. Doctors, PhDs, and the like would see their career start dates pushed back from around 30 to around 40, significantly decreasing the number of them who could be active at any given time as a portion of the population, assuming a constant retirement age. Well, those issues with student loans using the minimum earning model can be fixed rather simply, if I am not mistaken. The issue of finding willing lenders could be fixed either by increasing interest rates, or–my preferred option–have the state issue loans, as it is able to more easily absorb any hits it may take, especially considering the economic boost provided. As for the borderline you point out, it is nonexistent for the same reason progressive income taxes are not failing in this way: only the income above the minimum may be required payment, and only a percentage thereof. Field caps could presumably be coerced via accreditation standards. Don’t comply? Cool, your school isn’t accredited anymore. This is conjecture, though, as I am not totally aware of what agency is responsible for this. The issue you present with part-time students is fixable by having most students on a part-time basis, while those in fields wit a higher need for higher degrees (e.g. medicine) can be full time, as the pool is less saturated. A further concern is moral hazard. If the state provides access to student loans and does not require repayment until a given income is reached, and even then reduces the pace of repayment in proportion to how much the income exceeds that threshold, it will always be in the interest of the prospective student to go to college regardless of whether or not there is likely to be any improvement in employment or income. The prospective student doesn’t pay the cost of wrongly going to college yet reaps all the benefit if it works out. For this reason, it is more crucial that the state actively reduce college costs than that it subsidise their augmentation by enabling the continuance of present trends. Field caps also have the problem of not being school-relative. Places from a particular prestigious school are much more likely to result in an improved employment position than are places from a less prestigious school. To apply the same kind of cap to say, an Ivy League school as one would apply to a community college would not be ideal. Though I have no doubt such problems could be worked out, it would require a very complicated system to pull it off in the US. Don’t we already allow students to choose to be part-time if they think doing so will help them to make their degrees more affordable? I thought you were proposing that we universalise this. The moral hazard you present, though, is nullified through field caps. The field caps look even nicer when one notes that letting a small group of experts figure out which fields need more educated workers will have a better effect than letting each student try to guess on their own. The difference in prestige would not prevent the caps, though. If anything, the caps will let the less prestigious schools have some effect as the lower supply of people with degree X will mean more schools’ degree X will matter. The matter being presented in the US does present an interesting issue, but very desirable public loans, along with some coercion and risk of loss of accredited status may allow the strings to at the very least be pulled in a favorable direction. >For some fields, yes. For students going to school for a 2 or 4 year degree, spreading out the time can have positive effects, assuming there is a method of ensuring a very large amount of the labour force complies. Other fields, like medicine, already require a very large amount of time and thus are very much worth having most students attend full time. It doesn’t seem to make sense that if you have an oversupply of say, doctors, you should acquire the same number of doctors from a great medical school as you should from a poorer one. Better to shut down weak medical schools entirely. The state’s use of field caps would have to involve some kind of rationing whereby weaker universities and departments are shut down in favour of stronger ones so that the only available places are ones that will result in the higher salaries necessary to make the loans repayable. But at that point one still has to do something about the rising cost, because a cost that rises faster than the rate of inflation will eventually push up the necessary salary required to make repaying the loans affordable. Also, once the state is responsible for the entirety of the loans, the lending is more or less superfluous–the state might as well pay for college directly and then raise income tax on higher earners.